A lifeboat was first stationed in Harwich in 1821, though it was not until 1876 that the organisation now known as The Royal National Lifeboat Institution placed a boat here together with a shed in which to keep it (now the Harwich Society’s Lifeboat Museum). The RNLI Lifeboat was withdrawn in 1917, but following a massive increase in leisure boating activity in the Harwich Haven, this was restored in 1965 when a lifeboat shed was built on Ha’Penny Pier (since replaced by the Café) to house an inflatable lifeboat. In 1875 a meeting was convened in Harwich after the loss of the German steamer “Deutschland” with a review to establishing a Lifeboat Station. Following a further wreck, the RNLI sent a lifeboat to Harwich without waiting for the erection of a lifeboat house. The lifeboat was called the Springwell and was a self-righting type 35ft in length, 9ft in beam and crewed by 10 men. Miss E Burmester of London donated the “Springwell” which was built by “Woolfe of Shadwell”. Demand for the service grew during the second half of the 20th Century and the present lifeboat station was opened by Terry Waite in May 2002. The station now hosts a Severn Class Lifeboat, “Albert Brown”, which covers much of the North sea and a RIB “Steadfast and Sure” for use in more local emergencies. 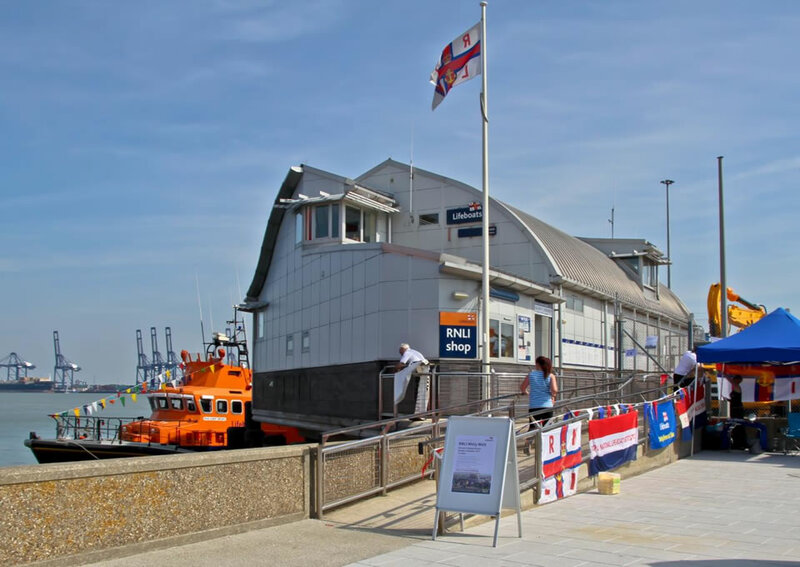 The building also has leisure and training facilities as well as an RNLI shop. The brave use of modern design and materials in the construction, works well despite the focal position in a town with over 200 listed buildings and ancient monuments. The station receives around 100 calls out every year which makes it one of the busiest stations in the UK. The shop is open daily during the summer months and occasionally during the winter.